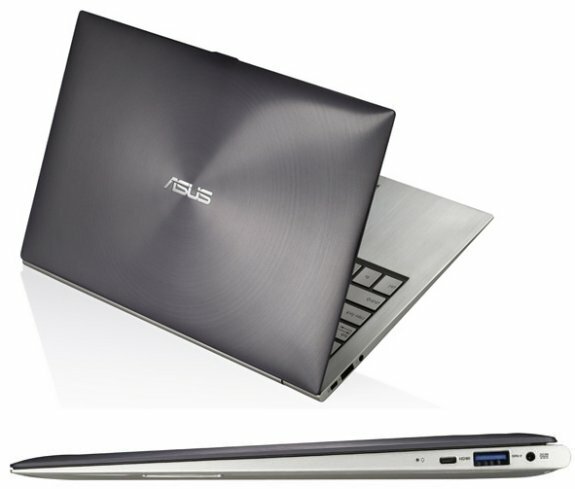 ASUS introduced the Zenbook ultrabook in North America, with prices starting at $999. The systems are available with 11.6" (1366 x 768 pixels) and 13.3" (1600 x 900 pixels) screens, the fastest models offer the Core i7-2677M processor, 4GB DDR3, 256GB SATA 6Gbps SSD, Bluetooth 4.0, USB 3.0, 50Whr battery (7+ hours of battery life), and a 0.3MP webcam. The full specifications of each model are listed below, prices range from $999 to $1,499. ASUS Chairman Jonney Shih unveiled the long-anticipated ZENBOOK™ that fuses masterpiece design and incredible performance at a global launch event in New York along with Intel Senior Vice President and General Manager of Sales and Marketing Group, Tom Kilroy. The “Ultra Era” event opened with a vivid, yet tranquil dance to Moon Water featuring a performance artist from the internationally renowned Cloud Gate Dance Theatre of Taiwan. The performance set the tone of the event, to display that the ASUS ZENBOOK™ is designed to be effortlessly enjoyable without compromising on performance. It exudes the perfect balance of elegance and power in an Ultrabook. Mr. Shih then introduced four key incredible principles that guided ASUS’ development team during the ZENBOOK™ design phase. Pure Design–Art melds seamlessly with technology upon viewing the ASUSZENBOOK™. Thesilver exterior panel features a concentric circle design that refracts a halo of light that excites the senses. With a thickness of 0.11” at the front and0.67” at the rear, the ZENBOOK™ UX21 exterior lines are sleek, making it the thinnest Ultrabook on the market and perfect for users constantly on-the-go, in the classroom or relaxing at home. Unrivalled Performance–The ZENBOOK™ is designed with an instant-on feature that resumes the system in about 2 seconds* and features incredible standby timesup to ten days*, which is four times more than the industry standard. Although svelte and sleek, the ZENBOOK™ packs an impressive and uncompromising list of technological breakthroughs. It uses the latest Intel® 2nd generation Core™processors (optimized for mobile use), SATA Revision 3.0 solid state storage (SSD), Bluetooth™ V4.0and USB 3.0. ASUS has also added USB Charger+ technology, which uses the powered USB 3.0 port to recharge portable devices in a fraction of the time it would normally take. To accommodate all of these technologies, ASUS engineers designed custom cooling technology using a V-shaped channel with a unique copper fin design for improved airflow and cooling.When battery life dips below 5 percent, the ZENBOOK™ will automatically save files in progress to prevent data loss. IncrediblyGreen - The ZENBOOK™ provides its users a peace of mind in knowing that they are consuming less energy. It utilizes ASUS’ patented Super Hybrid Engine II technology, which intelligently conserves battery life and allows the ZENBOOK™ to have up to 25% more battery life* than other Ultrabook designs. TranscendingAudio - Recognizing that an Ultrabook is not only a tool for work, but also for entertainment, each ZENBOOK™ is equipped with ASUS SonicMaster technology, an optimized fusion of hardware and software developed by the ASUS Golden Ear team and Bang &OlufsenICEpower®. SonicMaster provides a wide sonic spectrum surround sound that can fill a room with smooth jazz or the tranquil sound of a mountain stream. Leading Technology Partnership - Intel’s Senior Vice President and General Manager of Sales and Marketing Group, Tom Kilroy, expressed his excitement that Intel contributed the incredible processor technology for ASUS’s groundbreaking masterpiece. The ZENBOOK™ will be available for order in North America starting on Oct. 12, with prices starting at $999 (suggested MSRP).